Smart black leather sofa bed and tub chairs in a bright open plan area with fully fitted white kitchen. New appliances throughout with luxury granite worktops. The lounge has a LED 32 inch tv with full English package including Sky Sports (never miss the cricket and Premiership). Dining area for 4 using modern quality crockery, cutlery and cooking utensils. Beautifully tiled floors with spotlight lighting throughout the villa. 21 El Rancho is a delightful and comfortable home from home. Main bedroom 1 has LED tv with full cable package, a King Size bed, built in furniture and new En suite with his and her sinks and shower/bath. Bedroom 2 has 2 single beds with built in furniture. Both bedrooms have direct access to downstairs terraces. There are 3 terraces including a large roof terrace and a dining terrace with BBQ with views over the club, golf and sea on the horizon. Full Wi-Fi included. There are 3 sets of golf clubs saving money and effort. Quality tennis rackets are also available. My wife and I have holidayed at La Manga Club for the last 5 years and always thoroughly enjoyed the atmosphere, sports and feeling of security for our children. An opportunity to buy a property arose in 2011. We looked around a number of properties and had no hesitations in purchasing 21 El Rancho. The style and finish of the villa was in a different class. Our children love the property and so do we. I am sure you will also. Alistair and Josephine. La Manga club is just such a great location. We love golf, tennis, sunshine and pool holidays. La Manga has all these and more. We tend to eat out 3 or 4 times whilst on holiday and La Manga Club has a great variety of restaurants- however the supermarket provides us with our staple diet of BBQ's and refreshments. The club is also extremely safe for the children with security that brings great piece of mind. Our teenagers can explore without concern. Golf and tennis discounts are an essential. Check your accommodation offers sports rights- ours does, for 4 people. Bathroom 1 with new appliances. Large walk in shower, all fully tiled. En suite bathroom has 'his n hers' sinks and large bath with over shower. Both are immaculate. Lovely open plan living area with sofa bed and tub chairs. Entertainment unit with 32 inch LED tv with over 30 UK channels and air con. New flooring throughout the property. Log fire and spotlights throughout make a modern atmosphere. New appliances: oven, hob, fridge, freezer, washing machine, dishwasher and microwave. High gloss units with granite tops and s/steel sink. With a choice of three superb, 18-hole championship courses, each with its own unique style and terrain, a Par 47 course and first-rate practice facilities, there is something to challenge you, whatever your age and whatever your level. If you want to learn how to play golf or improve your skills, La Manga Club is just the right place as well. Our golf academy provides group and private tuition of the highest standards for all levels, from complete beginners to the most experienced players, as well as special junior golf academy courses for children and teens. Over its almost 40 years of history, the resort has hosted many top-level international golf tournaments and tour qualifying schools including five Spanish Opens; the European Ladies Team Championship; Spanish PGA, Seniors’, ladies’ and junior championships; ladies European tour Q-School; and the World Corporate Golf Challenge, as well as countless corporate, celebrity and charity golf events. Notes on accommodation: Beautiful black leather bed settee and tub chairs in an open plan area with fully fitted high gloss kitchen. New appliances throughout with luxury granite worktops and new Bosch appliances. The lounge has a LED 32 inch tv with full English package including Sky Sports (never miss the cricket and Premiership). Dining area for 4 using modern quality crockery, cutlery and cooking utensils. Beautifully tiled floors with spotlight lighting throughout the villa. 21 El Rancho is a delightful and comfortable home from home. Main bedroom 1 has LED tv with full cable package, a brand new King Size bed and new en-suite with his and her sinks and shower/bath. Bedroom 2 has 2 new single beds with new bedding. Both bedrooms have direct access to downstairs balconies. Outside: There is a beautiful front terrace set amongst palm trees and flowering shrubs, with a 30 second walk to one of the 9 community pools you may use. Sun loungers on the roof terrace catch all day sunshine and sun loungers are also available around the pool area. The pools are all a good size for swimming and fun yet not too big to become overcrowded. Centrally there are 28 tennis courts at the tennis centre where a communal pool can be accessed by all. Cleaning / Towels / Linen / Maid service: Linen and towels including beach towels included for 4. For stays over a week mid stay cleans and linen can be arranged. Lovely quiet, modern, clean villa. This review is from an elderly couple and is meant to be both informative and constructive. You need a car. Study the various car rental scams, the latest being underbody damage only pointed out when returned. Consider taking out adequate, cheap, insurance in the UK for full cover. Top marks for interest and promptness of response from the owners who obviously care for their quality of service and customer relations.. This villa has been well renovated and is spotlessly clean.. Ideal for a foursome seeking good value short term accommodation within one of the best sports complexes in Spain as well as many excellent eateries nearby. Best features were good size shower en-suite as well as separate bathroom. Availability of heating for colder nights in every room was a bonus, seldom required but well appreciated. Superb forceful hot water always available throughout. Modern kitchen with all appliances but lack of storage cupboards and slightly dangerous protruding exhaust canopy...easily avoided after the first physical head contact. Some drawers in the villa remain crammed with non important dated literature were, as a result, unavailable for other uses.. Attention is needed to drainage from shower and general basic security. Exterior wooden shutters are ill fitting and interior patio doors unlockable. Marble staircase down to sleeping accommodation is obviously part of the design but should be treated with caution by persons of any age. Towels bedding and particularly pillows are poor quality and as a result require changing more often. Suggest the expense of changing to top quality stuff of this order will more than pay back in very short time. Little things really do mean a lot. We suffered from non mosquito insect bites during sleep and this persisted despite us washing the bed sheets. We resorted to applying body insect repellent before retiring at night. Re-hash the villa information pack...a few parts have become well outdated and could cause inconvenience to first time La Manga Club visitors. We are very sorry to hear you did not enjoy your stay in our villa. We have had hundreds of guests and have never received such feedback before. In fact we have already had two more guests since your stay who had a lovely holiday. The next guest to arrive are coming for the third consecutive year! As the reviewer said himself the villa is spotlessly clean and the photographs show very well appointed. All the doors locked perfectly well-as they did at the time the guest initially felt there was a problem (they were given a thorough check over by a management company immediately) . We are always fastidious about responding to any feedback as customer service is our top priority. As the old adage says unfortunately you cannot please all the people all the time, despite your best efforts! Fantastic Villa with everything you need. Locared in a quiet spot on the club and close to one of the 9 pools the owners have been meticulous in making this the perfect holiday base. Information about the area and restaurant recommendations were spot on. We would not think twice about returning. 18 days in El Rancho Villa 21 was a great way to spend our holiday this year. 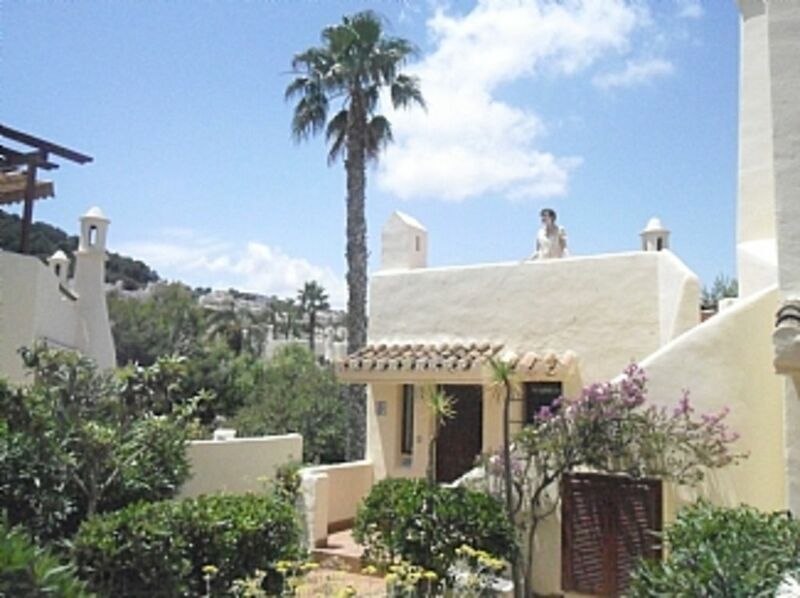 Perfect location on La Manga Club. Close to pools and only a short walk to amenities. Great outside space and lovely private roof terrace. Wouldn't need to think twice about a return visit. If you are a tennis enthusiast, La Manga Club could easily be defined as the ultimate tennis resort in Spain. Located at the very heart of La Manga Club resort, the internationally renowned tennis centre is one of Europe's finest outdoor facilities and is the focal point for many of the resort's sporting activities. The wonderful climate and floodlit courts mean that you can enjoy a match all year round, day or night. La Manga Club Tennis Centre has played host on a number of occasions to such prestigious events as the Davis Cup and the Fed Cup, as well as numerous ATP tournaments. La Manga Club is also proud to be an official partner of Tennis Europe. There are 28 tennis courts to choose from, including 20 clay courts, four hard courts and four artificial grass courts, as well as two paddle tennis courts and a squash court, not to mention a pro shop, equipment hire services, racket service centre, fitness centre and numerous other services. The nearest beach is 1 km away - the La Cala beach on the club. The Mar Menor is a 10 minute drive away. Car hire is not essential but recommended on the club. Taxis from the Alicante and San Javier airports can be organised by our management company if required. Booking Notes: Payments can be made by Paypal, cheque or bank transfer. Changeover Day: Saturday is changeover day in high season- however contact us for alternatives.